"How do you plan a backcountry ski trip? This is an important skill to refine. Trip planning allow you become acquainted with the area you plan to tour, identify the best snow conditions for riding, and anticipate instabilities. Last Sunday December 4th a group of friends from Boise ventured to visit Anthony Lakes (YES - the resort is OPEN!). 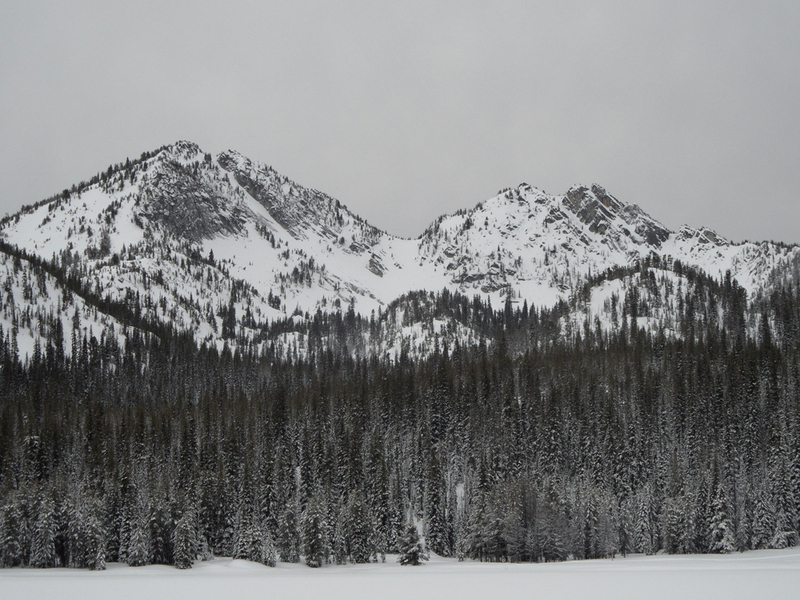 My friends have not been to Angel Basin before, and I was stoked to show them the superb ski lines and wonderful POW that can be at a sub range named "Little Alps" in the Elkhorn Mountains of Eastern Oregon. 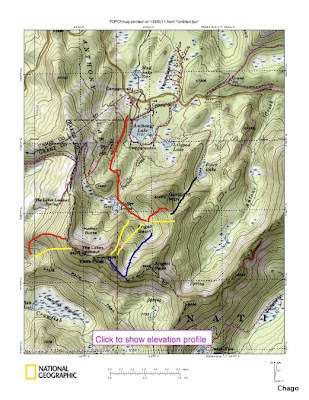 Red and blue lines are uphill tracks and yellow and black lines downhill tracks. Yellow lines are some popular lines I have skied before. We were concern about the effect of wind on N aspects, thus we kept the option open to ski a south aspect slope to the center-right in the topo map. The black line denotes a future line we dream about doing in the NEAR future. We printed enough copies of this map with UTM coordinates (easier to read and work with) for each of the party members. Unfortunately there are not many pics available from this area, and the various times I have skied there, visibility has been poor. But there are two pictures from www.splattski.com that shows our two intended destinations. Lee Peak in the Left, Lookout Mountain in the right. Next we googled pictures and review area using google earth. Lee Peak in the center, Lake Lookout Mountain to its left. 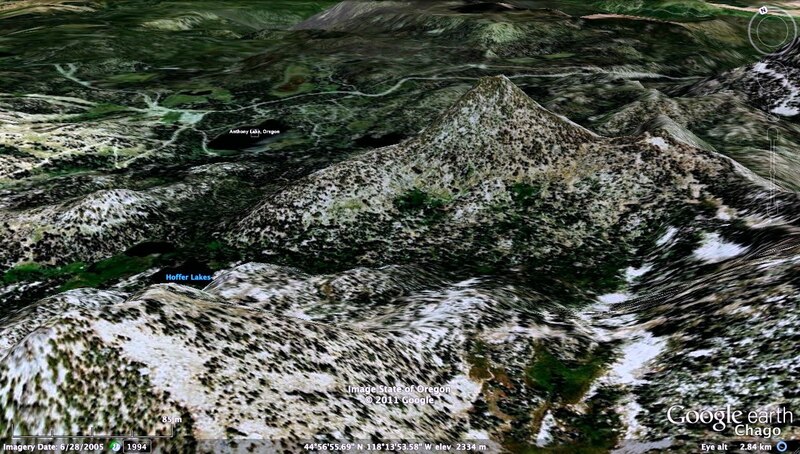 This "aerial" google picture from 1994 shows the area we intended to ski ... pretty much the center left line below Lee Peak (Lee is in the center). Angel Peak-Left, Lee Peak-Center, Lake Lookout Right. Above another google view from the same area but created in 2005. View to the North from the Top of Lee Peak. 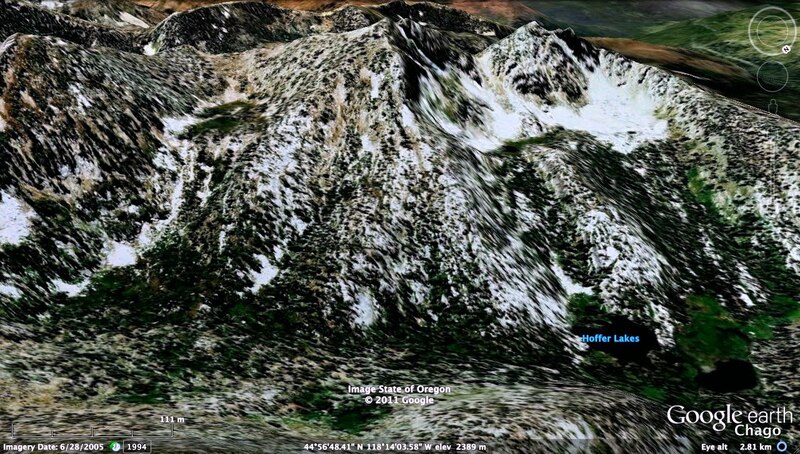 Gunsight Peak in the center. 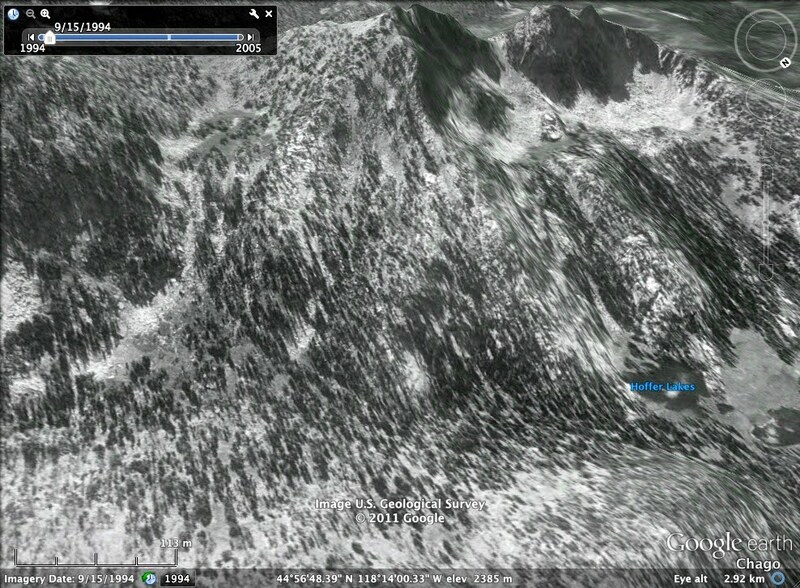 Google view from the top of hat we plan to ski (Lee north aspect shoots). 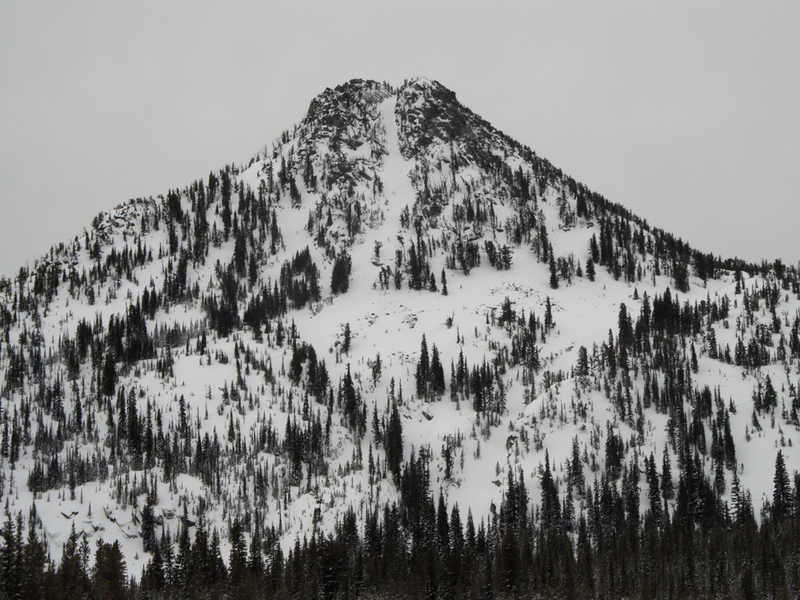 We skied the looker saddle in right of gunsight peak. Temps durin the 24 hours prior to our visit were in the -9 to -4 Deg C with moderate winds from the NW trending to calm in the evening, cloudy skies and no precipitation. Weather forecast of partially clouded skies clearing up in the afternoon, with moderate NW winds, and temps for the day in the range of -8 to -10 Deg C.
Wind slabs in top of depth hoar in a shallow snowpack. Rocks and many buried obstacles. We took note, and planned to pay close attention to aspects that might have been loaded with snow due to the moderate wind recorded Saturday, and the strong winds forecasted for Sunday. In addition we came prepared with "Rock" skis to address the buried obstacles concern. By 8 AM we were at the resort, and after a routine stop to visit my friends with the Anthony Lakes Ski Patrol, we skinned up to Angel Basin. The snow was soft, but it was obvious that there was not sufficient snow to cover the very abundant granite! A couple hundred feet below Lee Peak Summit we found a snowpack between 70 to 90 cm in depth. A snow pit in a 36-38 degrees gully with wind blown & new snow above old snow produced CTHQ2 results at 35 and 50 cm below the surface. Three CT failed at 50 cm, and one at 35 cm. Both layer interfaces (35 and 50 cm) consisted of weak layers composed of ~1mm near surface facets (NSF) crystals and mixed grains starting to round and sinter. It should be noted that, similar to the snowpack in Copper Mountain - Idaho, we did not find basal facet layers (Depth Hoar - DH) at Angel Basin's North or South aspects. A PST fracture propagation test at a 50 cm weak layer failed after a 40cm saw cut, suggesting that the weak layer & slab structure buried 50 cm below the surface have a fracture propagation potential. The Stability Quadrant shown above is a structured method use to assess slab avalanche stability. This method facilitates the review of the evidence we found of instability - "there is a high likelihood that a fracture failure will propagate if we were to find a weak trigger". Where we dig the pit the likelihood of a trigger was low (hard score), but as we continued touring and skiing, we were mindful about conditions and configurations that will augment the trigger likelihood, such as additional loading or thin spots in the snowpack. The slip likelihood, is the last stage during an avalanche fracture failure, and it is a function of slope angle. The Q2 results suggest that there is a moderate likelihood of a slide once a fracture is initiated and propagated in the slope angles we tested. This information allow us to manage terrain angles and continue searching for more information (handpits, quick-pits) to avoid areas that might have a high likelihood (Q1 scores) of slip. Finally, we identified structural weaknesses that assisted us in tracking the snowpack during the day; weak layer buried at 50 cm, a thin (less than 2 cm) weak layer with persistent grain types (NSF), and an identifiable slab (harder snow or slab in top of weak layer). As we travelled in Angel Basin, it was obvious that the slab structure was not present everywhere, and that was an important fact in the selection of slopes to ski. During a slab avalanche there are three distintive phases; fracture initiation or nucleation (triggering), fracture propagation (due to propagation wave), and slide/slip of slab. Once the fracture failure occurs gravitation (weight of slab) and coefficient of friction between slab and weak layer (above gliding surface) takes over. This theory has replaced the now obsolete shear theory, and it has been validated through many studies. 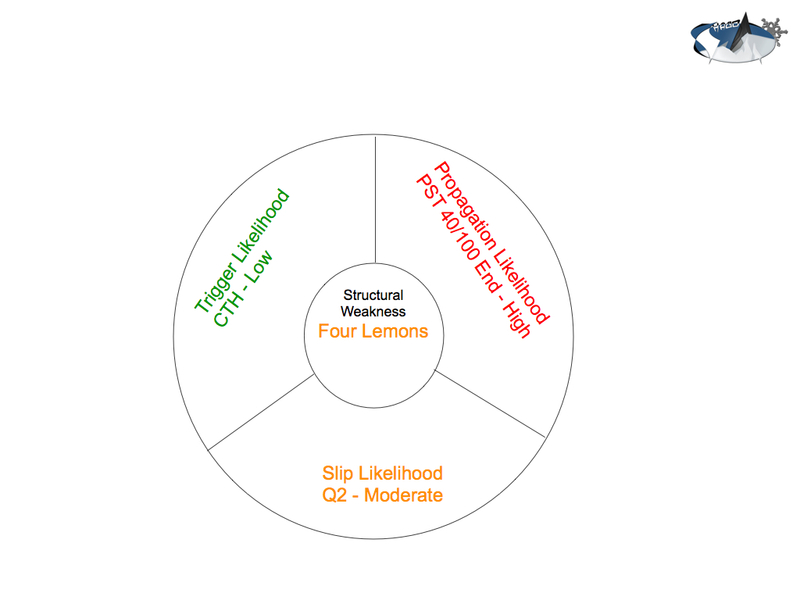 The stability quadrant shared above is a reflection of the NEW "Anti-Crack" fracture theory being applied to stability evaluation. There are no pictures to share from this trip. The weather forecast did not materialized, and the skies remained obscured, with the mountain shrouded in clouds and fog all day- like skiing in a glass of milk! I thought hard about not a posting a BC skiing area well away from Central Idaho Mountains. However, this is a great opportunity to share good practices with the Mores Creek Summit Skiers Community. 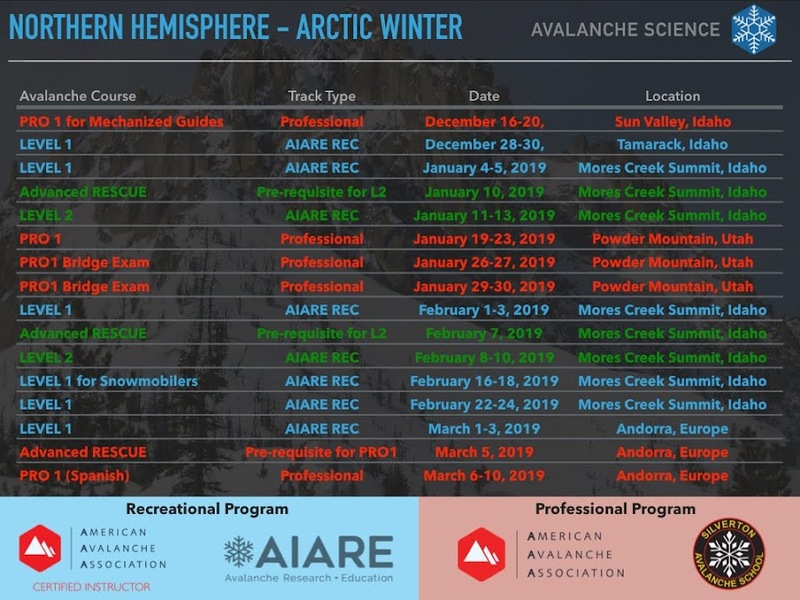 This blog posting briefly covered trip planing and integration of weather in identifying concerns, as well as reviewing a methodology to asses snow stability. Finally, The Elkhorn Mountains near North Powder and Baker City are abundant with BC skiing possibilities, that will delight Idaho BC skiers. One of the best advices I received MANY year ago was to ski in as many different snowpacks as possible to improve my avalanche terrain travelling skills. A vist by Idaho BC skiers to Angel Basin will provide opportunities to assist in the growth of your avalanche terrain travel skills as well.